"We do need to make it work as a business. But if we are enriching the community, then I think that's the greatest measure of our success. We've received so many kind and wonderful compliments, everything from 'What in the world are you thinking?' to 'Oh, thank you so much for being here.' 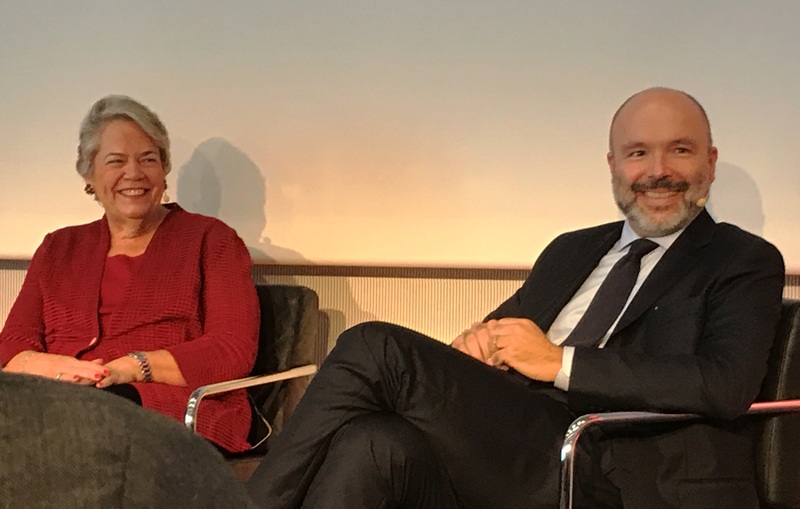 "
"You have whole generations being trained for shorter attention spans than books require," said Carolyn Reidy, president and CEO of Simon & Schuster, during the annual CEO Talk at the Frankfurt Book Fair on Wednesday. Reidy and Guillaume Dervieux, CEO of the family-owned French publishing company Albin Michel, fielded questions from journalists from five global industry publications. The topics ranged from the role of the publisher in today's divisive political climate to competition with digital, social media and more. Publishing consultant Ruediger Wischenbart moderated the discussion. Reidy described the battle for the consumer's attention and time as the "main thing," the "number one challenge" facing publishers, and one that has gotten only more critical since the advent of things like social media and especially video streaming services. She said it behooves publishers to "make sure in every way we can" that books remain "central to the discussion of what's going on in the culture." At the same time, Reidy and Dervieux agreed that for all of the dangers that they pose, social media does provide new opportunities for reaching consumers more directly than ever before and for finding new authors to publish, whether they be Youtubers, bloggers or Instagram poets. "I'm not so sure that we should be so anxious about it," said Dervieux. "For the moment, no indie author has said to us, 'no, I prefer to stay [independent], I don't want to have my book published.' "
When asked whether today's hostile political climate factors into decisions on what books to publish, Reidy answered that it does, adding that things have gotten so contentious that people of opposing viewpoints often "don't even want to understand" the other side. She said that S&S has always "made a point" of publishing points of view "from all sides" and "books we feel can help elucidate the conversation," and she suggested that the industry "would be in trouble" if publishers decided to publish only books "we all agree with." "The real question is the books that don't make us as comfortable, and should we be publishing those too," said Reidy. She encouraged publishers to "make sure that we stay open to cogent and well done books of all points of view, so that the discussion can continue on the level that we as publishers can hopefully help provide." Reidy said she felt that one of the "particularly troublesome" things about the current environment was the growing trend of calls for boycotts and censorship "bubbling up from the public." She argued that it is increasingly important for publishers to defend the right of freedom of expression "against mob rule." On the subject of self-published and independent authors, Reidy said that self-publishing has certainly caused traditional publishers to lose some customers; in particular the market for mass market romance novels has all but "dried up." What used to be a huge paperback market, she explained, has largely gone to digital original. 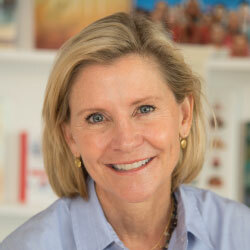 But while self-publishing may cause some consumers and authors to turn away from the traditional system, it also affords publishers an opportunity to "make the case of what it is we provide," which Reidy described as everything from "the editorial and marketing to legal representation and copy-editing." Dervieux, meanwhile, said that he did not think self-publishing was a competitor, but may actually be "the exact opposite of what we are doing." Noting that it's been 10 years since the mainstream adoption of e-books began, Reidy and Dervieux talked about why they think the dire predictions of the death of print have not come to pass. Reidy proposed that while nothing "went wrong" with e-books to cause the leveling-off of their popularity, consumers most likely simply "got tired of screens." She noted that for years before e-books, publishers had been "taking pennies out of the cost of making a book," but when digital became widespread, publishers began "spending years putting value back into the book." Dervieux wondered if perhaps the industry expected "too much, too soon," from the e-book format, and remarked that even by the "grace of Jeff Bezos and huge discounts," such a large shift in consumer habits could not happen in such a hurry. Reidy added that she believes "very firmly" that a new version of the book based on digital delivery will come eventually, though she does not know what it might look like. "Some person who is young and grew up with the screen will come up with something that I hope we recognize," she continued. "There will be a new form of it, because there has to be." Independent bookstores "have stepped in to help those affected by the deadly Wine Country wildfires that have destroyed more than 1,500 structures, forced thousands from their homes and left many others without power," the San Francisco Chronicle reported. 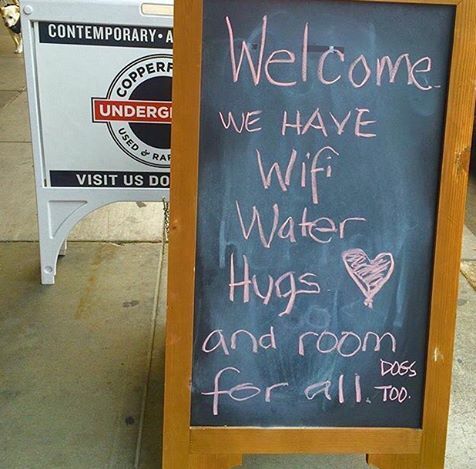 As Shelf Awareness noted yesterday, several Copperfield's Books locations are providing free wi-fi, charging stations for phones, bathrooms and a safe kid- and dog-friendly space for all who have been impacted by the tragic fires. Mimi Figlin, Copperfield's general manager, told the Chronicle, "There's always a safety net in bookstores, I believe. We're here for the community." Although she hoped the Napa and Calistoga stores would reopen Wednesday, she said it was difficult for booksellers to get to the Calistoga location and the Napa store was still without power. Readers' Books in downtown Sonoma closed Monday, but was back in business on Tuesday. "We want to be here for people who need a place to go," said buyer Jude Sales. "We feel like we want to do something--if nothing else, we want to be a safe place for people." Treehorn Books in Santa Rosa also opened Tuesday after being closed Monday. "Pretty much the whole block is closed here," said store manager Grant Hotaling. "I feel so bad for the community, and if there's anything I can do at all, it's to open the store and offer a place for people to come in and perhaps take their minds off their troubles." 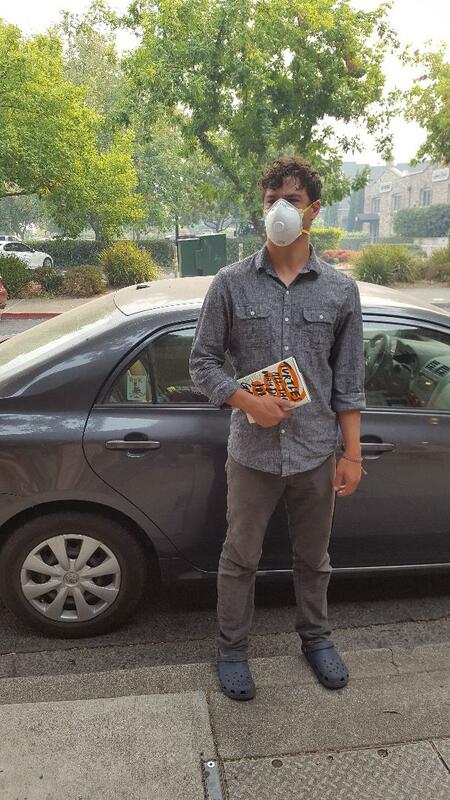 Napa Bookmine bookseller Paul delivered copies of John Green's new novel. On Tuesday, Napa Bookmine offered a special John Green delivery service: "The last 36 hours have been something from a nightmare, and we are sending well wishes to all of you, your friends, and families. Our community will come together just as we did after the earthquake. For all of you staying safe at home, we are offering a special delivery service... a signed copy of Turtles All The Way Down could be in your hands, delivered personally by a Napa Bookmine bookseller!!!" The store reported that they'd had a few requests for delivery, "and lots of positive response for good vibes. Very sweet and a fun thing to do during a very scary couple of days!" In an update on the fires' ongoing effects on "the bookstore-rich Sonoma and Napa counties," Bookselling This Week reported that Northern California Independent Booksellers Association executive director Calvin Crosby is working out of Marin since the NCIBA offices in Sonoma are without power. "Most stores are open (with low expectations of sales), but they are opening more as a community gathering place," Crosby said. "Most event schedules for the area have been canceled. Homes, stores, and businesses, including our office, still have no power." He added that NCIBA's Fall Discovery Show, scheduled for October 18-20 at the South San Francisco Conference Center, will be held: "Things were going according to plan, and we were feeling really good about it. This has kind of thrown a wrench in things." Crosby also suggested that anyone who feels the need to do something immediately should make a donation to the Book Industry Charitable Foundation. 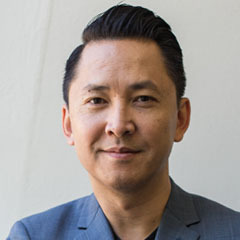 Viet Thanh Nguyen, fiction writer and cultural critic, for "challenging popular depictions of the Vietnam War and exploring the myriad ways that war lives on for those it has displaced." Jesmyn Ward, fiction writer, for "exploring the enduring bonds of community and familial love among poor African Americans of the rural South against a landscape of circumscribed possibilities and lost potential." Annie Baker, playwright, for "mining the minutiae of how we speak, act, and relate to one another and the absurdity and tragedy that result from the limitations of language." Sunil Amrith, historian, for "illustrating the role of centuries of transnational migration in the present-day social and cultural dynamics of South and Southeast Asia." Derek Peterson, historian, for "reshaping our understanding of African colonialism and nationalism in studies that foreground East African intellectual production." Novelist and memoirist Nora Johnson, "who had an early success with The World of Henry Orient, which was later made into a film with the help of her screenwriter father, Nunnally Johnson," died October 5, the New York Times reported. She was 84. In her novels, Johnson often drew on her experiences with her father, and her upbringing as a child of divorce, while her memoirs "told of a childhood spent amid glamour, living in New York with her mother but spending considerable time with her father and stepmother in Hollywood," the Times wrote. Johnson's other novels include The Two of Us (1984), Tender Offer (1985) and Perfect Together (1991). She also wrote the memoirs Coast to Coast: A Family Romance (2004) and You Can Go Home Again: An Intimate Journey (1982). Johnson's third and last marriage--to George Johnston in 2006--inspired a 2013 essay about their late-life relationship and his death for the "Modern Love" series featured by the Times, which noted that "the piece remains one of the most heavily read 'Modern Love' essays ever published." Tuesday night, Bookshop Santa Cruz, Santa Cruz, Calif., hosted Nobel Peace Prize winner Muhammad Yunus for the release of his new book, A World of Three Zeros: The New Economics of Zero Poverty, Zero Unemployment, and Zero Net Carbon Emissions (PublicAffairs). 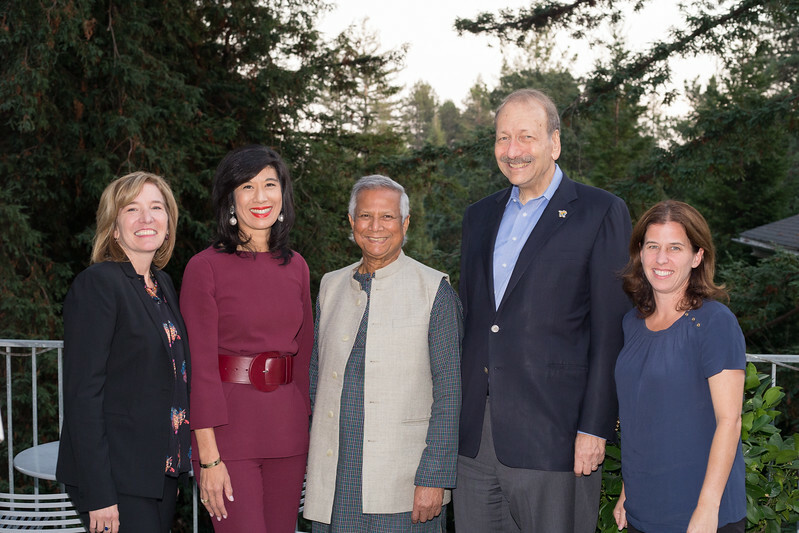 More than 500 people packed the event, held at the University of California, Santa Cruz, in conjunction with the University's Blum Center on Poverty, Social Enterprise and Participatory Democracy. Mystery to Me, Madison, Wis., shared a pic of its latest chalkboard creation on Facebook, noting: "Have you seen our new sign yet? It gives some pretty solid advice." The advice: "Psst... You there! Come here. Closer, closer, come on, closer. 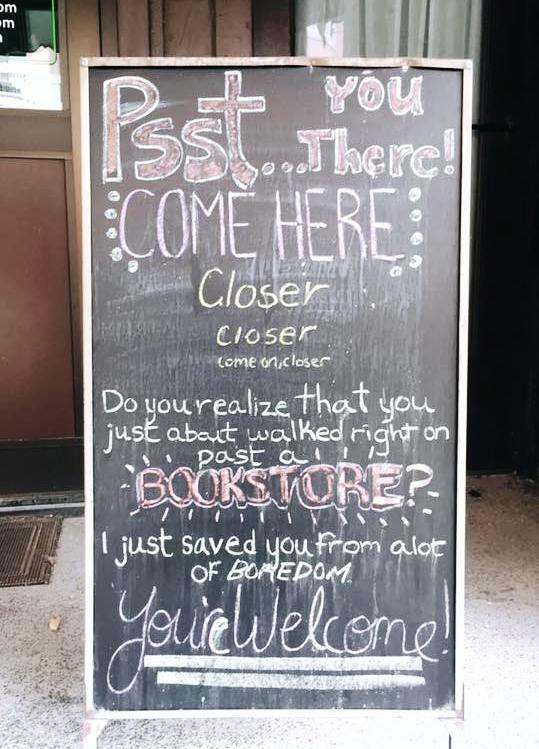 Do you realize you just walked right on past a BOOKSTORE? I just saved you from a lot of boredom. You're welcome!" Effective October 23, Karen Corvello is joining the University Press Sales Associates consortium as northeast sales rep for the MIT Press, Princeton University Press and Yale University Press. She was most recently regional manager in New England and upstate New York for Baker & Taylor. Earlier she was a board member of the New England Independent Booksellers Association, worked for more than a decade at R.J. Julia Booksellers, Madison, Conn., as a buyer and marketing associate and was a publicist at Yale University Press. Grandpa's Ghost Stories, written and illustrated by James Flora (Feral House). Fresh Air: Jimmy Fallon, author of Everything Is Mama (Feiwel & Friends, $16.99, 9781250125842). Today Show: Gretchen Rubin, author of The Four Tendencies: The Indispensable Personality Profiles That Reveal How to Make Your Life Better (and Other People's Lives Better, Too) (Harmony Books, $24, 9781524760915). Harry: Molly Sims, author of Everyday Chic: My Secrets for Entertaining, Organizing, and Decorating at Home (Dey Street, $24.99, 9780062439635). Wendy Williams: Ivana Trump, author of Raising Trump (Gallery, $26.99, 9781501177286). Universal Cable Productions has partnered with Shout! Factory to develop a TV series based on Bill Carter's 2006 book Desperate Networks, Deadline reported. Carter, former longtime New York Times media reporter and current CNN contributor, will write the adaptation of the book, which "chronicles the inner workings of the television industry circa 2000s, networks' ratings wars, and the true life portraits of larger-than-life moguls who navigate this high-stakes business." Deadline noted that the deal "comes as another insider book about TV wars by a NYT reporter-turned CNN personality, Brian Stelter's Top of the Morning: Inside the Cutthroat World of Morning TV, is being used as source material for a hot new TV series starring Reese Witherspoon and Jennifer Aniston." 11 a.m. Jonathan Eig, author of Ali: A Life (Houghton Mifflin Harcourt, $30, 9780544435247). 12 p.m. A discussion on the middle class with Nancy MacLean, author of Democracy in Chains: The Deep History of the Radical Right's Stealth Plan for America (Viking, $28, 9781101980965), and Ganesh Sitaraman, author of The Crisis of the Middle-Class Constitution: Why Economic Inequality Threatens Our Republic (Knopf, $28, 9780451493910). 1 p.m. Lee Dugatkin, co-author of How to Tame a Fox (and Build a Dog): Visionary Scientists and a Siberian Tale of Jump-Started Evolution (University of Chicago Press, $26, 9780226444185). 2 p.m. Erick Erickson, author of Before You Wake: Life Lessons from a Father to His Children (Hachette, $20, 9780316439558). 3 p.m. A discussion on American westward expansion with Daniel Sharfstein, author of Thunder in the Mountains: Chief Joseph, Oliver Otis Howard, and the Nez Perce War (Norton, $29.95, 9780393239416), and Roger Hodge, author of Texas Blood: Seven Generations Among the Outlaws, Ranchers, Indians, Missionaries, Soldiers, and Smugglers of the Borderlands (Knopf, $28.95, 9780307961402). 4 p.m. David Haskell, author of The Songs of Trees: Stories from Nature's Great Connectors (Viking, $28, 9780525427520). 5 p.m. Carter Smith, author of Gangs and the Military: Gangsters, Bikers, and Terrorists with Military Training (Rowman & Littlefield, $37.99, 9781442275164). 8:15 p.m. Elliott Abrams, author of Realism and Democracy: American Foreign Policy after the Arab Spring (Cambridge University Press, $24.99, 9781108415620). 10 p.m. A panel discussion on banned books with previously challenged authors David Levithan, Coe Booth and Ariel Schrag. 11:15 p.m. Peter Cozzens, author of The Earth Is Weeping: The Epic Story of the Indian Wars for the American West (Vintage, $20, 9780307948182). Bahá'í poet and teacher Mahvash Sabet was named this year's recipient of the PEN International Writer of Courage award by PEN's Pinter Prize winner by Michael Longley. The award is shared with a writer who has been persecuted for speaking out about their beliefs, selected by the winner in consultation with English PEN's Writers at Risk committee. Sabet, who was released in September after being imprisoned for almost 10 years in Iran, began writing poetry while incarcerated. Prison Poems, a collection of her work, adapted from Persian by Bahiyyih Nakhjavani, was published in the U.K. in April 2013 by George Ronald Publisher. Longley said he is "humbled to share the PEN Pinter Prize with Mahvash Sabet, an Iranian poet condemned in 2010 to 20 years in prison simply because of her Bahá'í faith and her work on behalf of the Bahá'í community: a songbird trapped in a cage. Mahvash is at heart a lyrical poet who sings the beauty of the world. Her imagination is rhapsodic. Her poems want to soar. I rejoice that she has been released from prison. Her incarceration by the Iranian authorities was a sin against the light. The power of dictators to silence and imprison writers continues to 'put all heaven in a rage.' "
In her acceptance speech--delivered by comedian Omid Djalili, a member of the Bahá'í faith--Sabet said, "Ten years of my life have just passed behind bars, and as I re-enter the world I find myself given this incredible award. It is a wonder to me and a mystery. "Coming back into the light after these ten long years in darkness has not been easy. The changes I see all round me are truly astonishing. The pace of life is overwhelming. But the hardest thing for me is to know that even though I am walking free, many other friends and colleagues still remain behind bars. "So in the midst of my wonder, I am filled with anguish. I am torn between joy and sorrow at this moment. And in thanking you for this great honor, I would like to speak on behalf of all whose rights and freedoms have been deprived.... This is what PEN did for me, by championing my cause." Shortlists have been released for the Chartered Management Institute's 2018 Management Book of the Year. Five category winners and an overall winner will be announced at an awards event at the British Library on February 6, 2018. The winning author receives £5,000 (about $6,605). You can see the complete shortlists here. Leonardo da Vinci by Walter Isaacson (Simon & Schuster, $35, 9781501139154) is a biography of the Renaissance's most famous polymath. Where the Past Begins: A Writer's Memoir by Amy Tan (Ecco, $28.99, 9780062319296) explores the inspirations for the author's novels. Chasing Light: Michelle Obama Through the Lens of a White House Photographer by Amanda Lucidon (Ten Speed Press, $29.99, 9780399581182) is a photograph collection about the former First Lady. Deep Freeze by John Sandford (Putnam, $29, 9780399176067) is the 10th Virgil Flowers mystery. Malala's Magic Pencil by Malala Yousafai, illustrated by Kerascoët (Little, Brown, $17.99, 9780316319577) is the Nobel Peace Prize winner's first picture book. My Journey to the Stars by Scott Kelly, illustrated by André Ceolin (Crown, $17.99, 9781524763770) is the astronaut's picture book memoir. The RBG Workout: How She Stays Strong... and You Can Too! by Bryant Johnson (Houghton Mifflin Harcourt, $14.99, 9781328919120) is a fitness guide by Ruth Bader Ginsburg's personal trainer. How Not to Get Rich: The Financial Misadventures of Mark Twain by Alan Pell Crawford (Houghton Mifflin Harcourt, $27, 9780544836464) looks at Twain's many financial misfortunes. A Secret Sisterhood: The Literary Friendships of Jane Austen, Charlotte Brontë, George Eliot, and Virginia Woolf by Emily Midorikawa and Emma Claire Sweeney (Houghton Mifflin Harcourt, $27, 9780544883734) explores famous female literary friendships. Before You Know It: The Unconscious Reasons We Do What We Do by John Bargh (Touchstone, $26, 9781501101212) looks at the many roles of the unconscious mind. Wonderstruck, based on the children's book by Brian Selznick, connects the lives of a Midwestern boy and a girl in New York City 50 years ago. It opens October 20. The Snowman, based on the thriller by Jo Nesbø, opens October 20. Michael Fassbender stars as Detective Harry Hole, who is investigating a woman's disappearance. Same Kind of Different as Me, based on the book by Ron Hall, Denver Moore and Lynn Vincent, opens October 20. Greg Kinnear stars as an art dealer who befriends a seemingly dangerous homeless man played by Djimon Hounsou. The World of Tomorrow: A Novel by Brendan Mathews (Little, Brown, $28, 9780316382199). "The World of Tomorrow is so wise and so ambitious in scope, with characters so complex, sympathetic, and real, that you will be hard-pressed to set it aside at a reasonable hour. Mathews' success in rendering the physicality of New York City just before World War II, the complexities of the Irish-American experience, and the first awful rumblings of the Holocaust, along with all the details of class, race, family, tragedy, comedy, heroics, and jazz, make this a truly immersive reading experience. With beautiful prose, a plot that manages strand after strand of narrative without ever becoming knotted or coming undone, and a cast of characters as alive as any on the page, this novel is a masterpiece." --Robert McDonald, The Book Stall at Chestnut Court, Winnetka, Ill.
Fever: A Novel by Deon Meyer, translated by K.L. Seegers (Atlantic Monthly Press, $26, 9780802126627). "Fever, which grabbed me from the beginning, takes place in South Africa several years after a devastating illness wipes out most of the planet. It starts as a thrilling survival tale between a brilliant father and his 13-year-old son and quickly evolves into a fascinating study of human nature and the perils of building a new civilization from scratch. The survivalist details throughout the novel are especially fascinating, as are the conflicts within the society as it grows. A dense, captivating read that drew me in and kept me hooked." --Elissa Englund, Bank Square Books, Mystic, Conn.
Close Enough to Touch: A Novel by Colleen Oakley (Gallery Books, $16, 9781501139291). "It was just a kiss, but it nearly killed her. Jubilee is allergic to people. She can't be touched by strangers, well-meaning or not. She retreats into her shell, away from the world, but her high school years pass, then her parents are gone, and, finally, she must move out into the world or die. She finds a home for her quiet life in a library, until Eric finds her and insists that she discover the truth of a life lived without fear. Close Enough is filled with real life, real people, and the search for happiness that we all recognize. It is a truly moving story from a rare gem of an author." --Linda Bond, Auntie's Bookstore, Spokane, Wash. The Book of Gold by Bob Staake (Schwartz & Wade, $17.99, 9780553510775). "Isaac Gutenberg has a distinct lack of interest in anything and everything until a shopkeeper tells him about the Book of Gold, said to turn to gold when opened and hold the answers to everything. This sets Isaac on an adventure to find the legendary book, opening lots of books and discovering lots of interesting things along the way. I, of course, know the fascination of discovery that comes with reading, and as a bookseller, I love being able to pass that on to other readers and potential readers. No one has done such an excellent job of capturing the feeling of discovery and the wonder of reading as Bob Staake has in The Book of Gold. This is a must-have for all book lovers, young and old." --Melissa Oates, Fiction Addiction, Greenville, S.C.
Greetings from Witness Protection! by Jake Burt (Feiwel & Friends, $16.99, 9781250107114). "After years of being bounced around the foster care system, Nicki Demere is offered a chance to live with a family that is looking for a second child. The catch is that this family is in the Witness Security Program, and the theory is that an additional family member will add another layer of disguise and make it more difficult for the mob to hunt them down. Nicki agrees to go along, and in the process gets a new name, a bland profile, and a little brother with issues. Jake Burt's middle-grade novel is filled with humor and suspense, and Nicki/Charlotte is an absolutely terrific character." --Dave Shallenberger, Little Shop of Stories, Decatur, Ga.
Wild Bird by Wendelin Van Draanen (Knopf, $17.99, 9781101940440). "Wild Bird is about a girl adrift in the choices she's made--in drugs, alcohol, and the friends she's chosen--and a family that doesn't know how to bring her back to them whole, if not undamaged. Wren Clemmens struggles to discover who she is and who her true friends are when her parents send her to an eight-week-long wilderness camp, the last chance they have to rescue her from herself. Filled with great wilderness tips, this was a one-sit read and I recommend it highly. It is never too late to be a warrior!" --René Kirkpatrick, University Book Store, Seattle, Wash.
Each member of the Boisdoré family is rudderless, emotionally adrift; their only common anchor is their once grand but now uninhabitable New Orleans house, purchased with Tess's inheritance and restored by Joe, a furniture craftsman. A longstanding magnolia tree has crashed through the roof, landing in the middle of the kitchen and serving as a tangible reminder of home's fragility and impermanence. C. Morgan Babst uses the storm's ferocity to expose the deep ruin at the family's roots. "The water... had been more active and more sinister. It had broken what was built to keep it back. It had snuck in along channels dug to lead it away. It had acted as if with the intent to swallow, to smother, to ruin, to uproot, but most of all, to lift. It had raised sewage, dirt, poisons, furniture, cars, homes, families high above the ground as if to allow God to get a better look, and the things He rejected it had dropped, left them strewn in ruined piles." 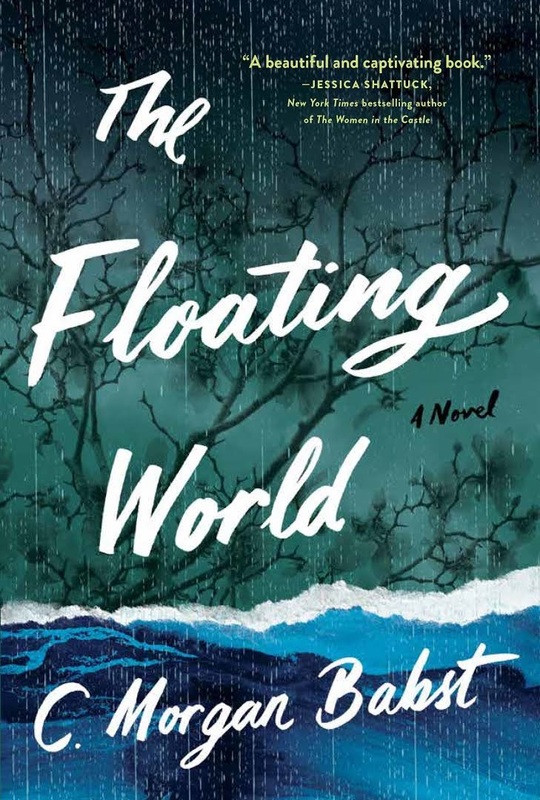 The Floating World begins on the 47th day after Hurricane Katrina's landfall and is told in flashbacks from the perspective of each family member to provide some--but not all--answers surrounding the reasons for Cora's disappearance. With a gripping yet deliberate narrative infused with vivid descriptions, Babst takes her time with this story, allowing it to build slowly and methodically with an appropriate weight, enhancing the confusion wrought by the storm. In contrast, Cora's point of view significantly intensifies the pace, lending an urgency to the novel and making her narrative feel almost cyclonic. A native of New Orleans who evacuated one day before Hurricane Katrina, Babst has an intimate understanding and knowledge of the region's people and rich culture, its topography and the complex forces of race and class. The result is in a timely debut novel about the power of nature and its omnipresent potential for destruction in every aspect of our lives. --Melissa Firman, writer, editor and blogger at melissafirman.com. Shelf Talker: In the aftermath of Hurricane Katrina, a dysfunctional family copes with the destruction of their home and a daughter's mysterious disappearance.